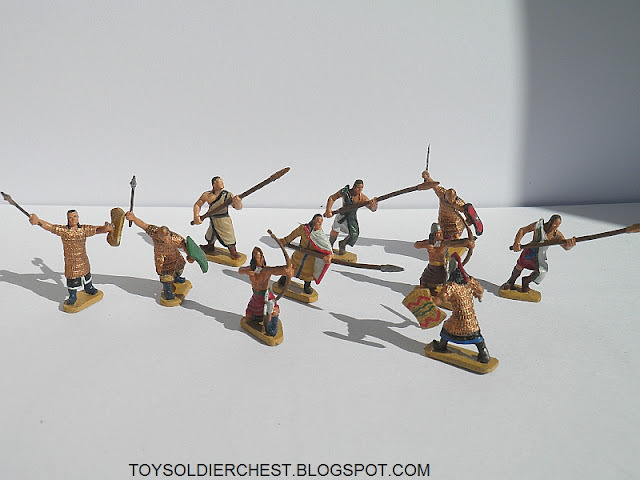 Here we have another Caesar Miniatures review, some of the most relevant armies that Caesar have made. We are talking of the Hittites. It is one of the most appalling box arts I've ever seen. I had to say to myself twice "forget the box art, the figures inside are fine". They seem a choir of renacentist women singing. Probably in my top ten of worst artboxes. Anything, just a transparent plastic would have been better. 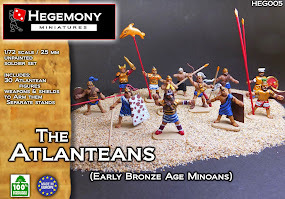 Normally Caesar Miniatures have wonderful, sharp and crisp sculpting, and yes, the detail in this set is fantastic. But for some reason, they don't have the right anatomical proportions that other Caesar sets have. The heads of some of the figures are very small, and nearly all figures have very big and disproportional hands. The closed fists of the leader is as big as his head! some of their feet are also too big. The spears are too thick, which could be understood, but also the spearheads are very big, not in proportion with other Caesar sets. One of the spearmen has a very small stand which makes him unbalanced, but this is easily solved by glueing him into a bigger stand. We have a rather strange set to review today. The Hittites are still quite obscure and hard to research, but we do have some of the depictions the Egyptians made. Although they isn't anything very wrong, the combination and amount of the different characteristics are quite incorrect in my opinion. Too many soldiers don't wear helmets, and they have the "elf" style hairstyle, as though they have been taken from a Osprey book, and in my humble opinion this is too common among the soldiers. The archers with the boots just seem wrong. Being bare-chested and wearing boots doesn't fit together very well. It is true that the Hittites used these characteristic boots, but again it was not a 100 % common characteristic. Some of the soldiers would use sandals or just go barefoot. And in some cases they seem that they are wearing clothes for winter in the Anatolian mountains, not in the desert of Qadesh. All shields have the same dimensions and shape, and this is not what we see in the Qadesh depictions of the Egyptians. Even if they are historically correct, not all the troops again would have used them. "The army representation score is the potential of the soldiers to be used for other purposes different to the one originally intended"
Having so many characteristic hairstyles, boots, armour, etc, they are not of much use besides being Hittites. 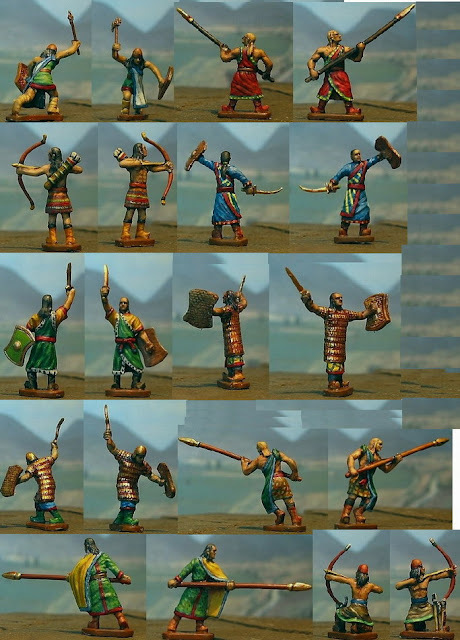 Some of the archers with some conversion could be used as other Anatolian or a Middle East tribe, but they are of limited use. "I feel that many reviews are oblivious to this point - there are fantastic figures, which you can´t say anything against, but they are just too "correct", maybe too static, and just boring. So I feel that this is an important point when deciding if you buy this set"
I have mixed feelings here, with the fun of this set, and in general, with this set. They are different, they have good quantity of poses, two unique leaders, but they are not what I expected as Hittites. They lack some of the more typical depictions of them, you are given a leader which is not more than a man with sword, so we consider him as an officer, and a true king would have been much more appreciated. Also, the other unique figure has nearly the same pose as one of the normal types, which I feel is having lost a good chance to give a more different sort of figure. 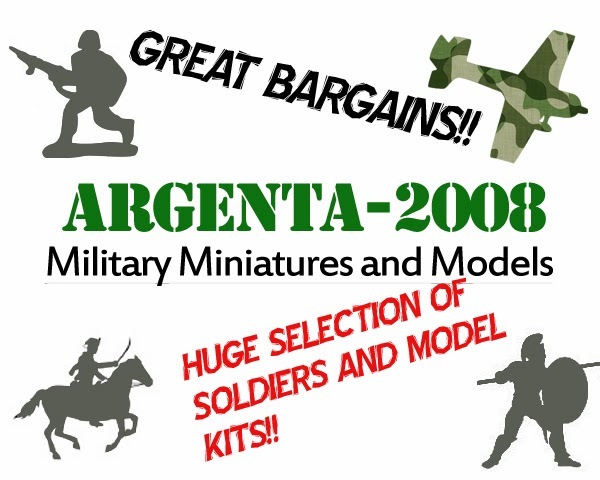 This is a very good set for wargaming. 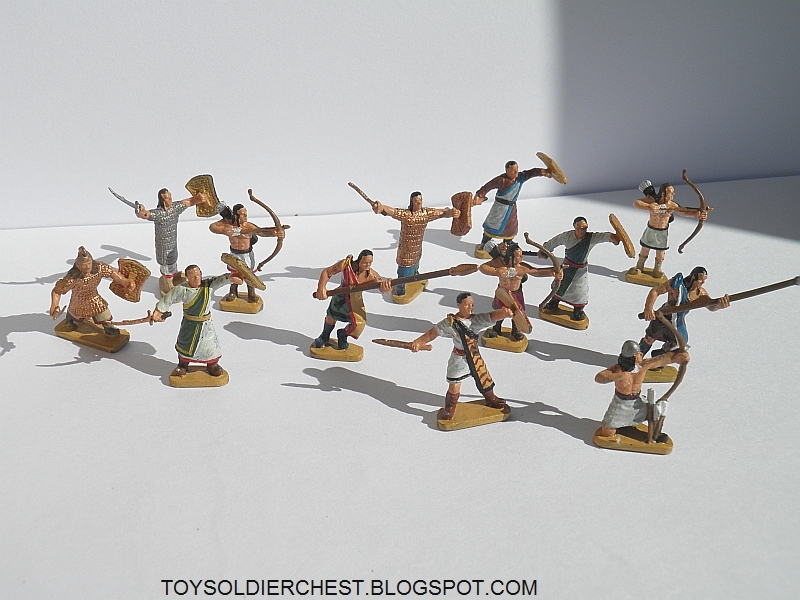 You are given all the different sorts of troops, and in good ratio (albeit if a bit too many armoured men without spears maybe, this seems to represent an elite Hittite army), so it scores high here. Some sort of standard bearer and king is the only thing it lacks to be a ten. 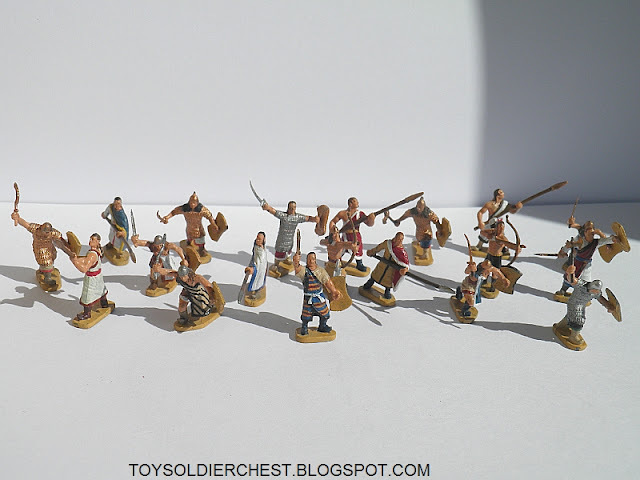 "The price value ratio of these soldiers will vary between every shop you go to, and the best I can do is judge by their average price on eBay"
As with most Caesar Miniatures, you can find them for 8-9 GBP shipped, which is a fine price for detailed figures, numerous and obscure , such as these are. "A bit unfulfilling, but a must for any collector"
I feel that this set could have been done a lot better, with just a bit better combination of the clothes, armour and hairstyles,and with a tiny bit better sculpturing, I was expecting a lot, something like the Trojans, where everything seems to fit perfectly, even if there is very little information.Here with more information, they seem too rigid in the interpretation of the figures. All the same, we have to thank Caesar just for trying to make this set, because without the Hittites we would be lacking one of the most important empires and peoples of ancient history. 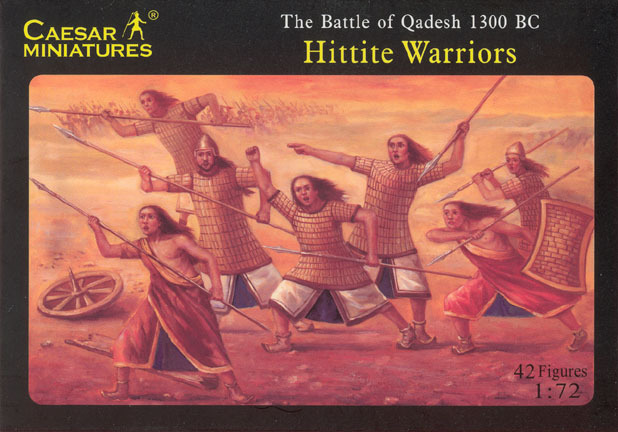 And as it is quite improbable that we will get Hittites made in any other brand, we'll have to stick with these. "Your figures could appear here if you want! just send me a email with the pictures to tam_cob@hotmail.com and I´ll gladly include them"
Thanks for reading, and see you in the next battle!